Meningioma, the term coined by Harvey Cushing, refers to a set of tumors that arise contiguously to the meninges (see the image below). Case 1: Surgical view of the tumor. The dura is opened, and the meningioma can be seen extending en plaque over the surface of the brain. See Brain Lesions: 9 Cases to Test Your Management Skills, a Critical Images slideshow, to review cases including meningiomas, glioblastomas and craniopharyngiomas, and to determine the best treatment options based on the case history and the associated images. Meningiomas may occur intracranially or within the spinal canal. They are thought to arise from arachnoidal cap cells, which reside in the arachnoid layer covering the surface of the brain. See the images below. Case 1: MRI of a meningioma on plaque. Case 1: Bone-window CT reveals calcification of the meningioma. Meningiomas commonly are found at the surface of the brain, either over the convexity or at the skull base. In rare cases, meningiomas occur in an intraventricular or intraosseous location. The problem of classifying meningioma is that arachnoidal cells may express both mesenchymal and epithelial characteristics. Other mesodermal structures also may give rise to similar tumors (eg, hemangiopericytomas or sarcomas). The classification of all of these tumors together is controversial. The current trend is to separate unequivocal meningiomas from other less well-defined neoplasms. Undoubtedly, advances in molecular biology will allow scientists to determine the exact genomic aberration responsible for each specific neoplasm. Mortality and morbidity rates for meningiomas are difficult to assess. Some meningiomas are discovered fortuitously when CT or MRI is done to assess for unrelated diseases or conditions. Therefore, some patients die with meningioma and not from it. Estimates of the 5-year survival usually range from 73-94%. Factors that may be predictive of a high postoperative morbidity rate include patient-related factors (eg, advanced age, comorbid states such as diabetes or coronary artery disease, preoperative neurological status), tumor factors (eg, location, size, consistency, vascularity, vascular or neural involvement), previous surgery, or previous radiation therapy. Meningiomas are more prevalent in Africa than in North America or Europe. In Los Angeles County, meningioma is reported more commonly in African Americans than in others. Meningiomas afflict women more often than men. The male-to-female ratio ranges from 1:1.4 to 1:2.8. The female preponderance may be less pronounced in the black population than in other groups. Evans DG. Neurofibromatosis type 2: genetic and clinical features. Ear Nose Throat J. 1999 Feb. 78(2):97-100. [Medline]. Ibebuike K, Ouma J, Gopal R. Meningiomas among intracranial neoplasms in Johannesburg, South Africa: prevalence, clinical observations and review of the literature. Afr Health Sci. 2013 Mar. 13(1):118-21. [Medline]. Sughrue ME, Rutkowski MJ, Aranda D, Barani IJ, McDermott MW, Parsa AT. Treatment decision making based on the published natural history and growth rate of small meningiomas. J Neurosurg. 2010 Apr 30. [Medline]. Pieper DR, Al-Mefty O, Hanada Y, Buechner D. Hyperostosis associated with meningioma of the cranial base: secondary changes or tumor invasion. Neurosurgery. 1999 Apr. 44(4):742-6; discussion 746-7. [Medline]. Hallinan JT, Hegde AN, Lim WE. Dilemmas and diagnostic difficulties in meningioma. Clin Radiol. 2013 Aug. 68(8):837-44. [Medline]. 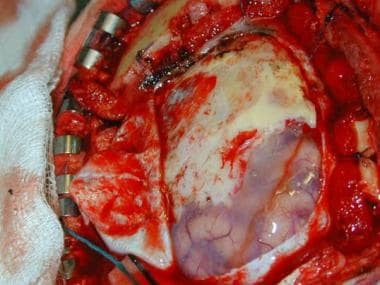 Majchrzak K, Tymowski M. Surgical treatment of the tentorial and falco-tentorial junction meningiomas. Minim Invasive Neurosurg. 2009 Apr. 52(2):93-7. [Medline]. Arima T, Natsume A, Hatano H, et al. Intraventricular chordoid meningioma presenting with Castleman disease due to overproduction of interleukin-6. Case report. J Neurosurg. 2005 Apr. 102(4):733-7. [Medline]. Ragel BT, Jensen RL, Couldwell WT. Inflammatory response and meningioma tumorigenesis and the effect of cyclooxygenase-2 inhibitors. Neurosurg Focus. 2007. 23(4):E7. [Medline]. Kim JH, Lee SH, Rhee CH, et al. Loss of heterozygosity on chromosome 22q and 17p correlates with aggressiveness of meningiomas. J Neurooncol. 1998 Nov. 40(2):101-6. [Medline]. Albrecht S, Goodman JC, Rajagopolan S, Levy M, Cech DA, Cooley LD. Malignant meningioma in Gorlin's syndrome: cytogenetic and p53 gene analysis. Case report. J Neurosurg. 1994 Sep. 81(3):466-71. [Medline]. Verstegen MJ, van den Munckhof P, Troost D, Bouma GJ. Multiple meningiomas in a patient with Rubinstein-Taybi syndrome. Case report. J Neurosurg. 2005 Jan. 102(1):167-8. [Medline]. Hao S, Smith TW, Chu PG, et al. The oncofetal protein IMP3: a novel molecular marker to predict aggressive meningioma. Arch Pathol Lab Med. 2011 Aug. 135(8):1032-6. [Medline]. Niedermaier T, Behrens G, Schmid D, Schlecht I, Fischer B, Leitzmann MF. Body mass index, physical activity, and risk of adult meningioma and glioma: A meta-analysis. Neurology. 2015 Oct 13. 85 (15):1342-50. [Medline]. Hughes, S. Overweight and Lack of Exercise Linked to Meningioma. Medscape Medical News. Available at http://www.medscape.com/viewarticle/851300. September 22, 2015; Accessed: December 7, 2015. Milham S. Meningioma and mobile phone use. Int J Epidemiol. 2010 Aug. 39(4):1117; author reply 1119. [Medline]. Lee JW, Kang KW, Park SH, et al. 18F-FDG PET in the assessment of tumor grade and prediction of tumor recurrence in intracranial meningioma. Eur J Nucl Med Mol Imaging. 2009 Oct. 36(10):1574-82. [Medline]. Abdel Kerim A, Bonneville F, Jean B, Cornu P, LeJean L, Chiras J. Balloon-assisted embolization of skull base meningioma with liquid embolic agent. J Neurosurg. 2010 Jan. 112(1):70-2. [Medline]. Zielinski G, Grala B, Koziarski A, Kozlowski W. Skull base secretory meningioma. Value of histological and immunohistochemical findings for peritumoral brain edema formation. Neuro Endocrinol Lett. 2013 Apr 5. 34(2):111-117. [Medline]. Wang S, Yang W, Deng J, Zhang J, Ma F, Wang J. Correlation between 99mTc-HYNIC-octreotide SPECT/CT somatostatin receptor scintigraphy and pathological grading of meningioma. J Neurooncol. 2013 Jul. 113(3):519-26. [Medline]. Rosenberg LA, Prayson RA, Lee J, Reddy C, Chao ST, Barnett GH, et al. Long-term experience with World Health Organization grade III (malignant) meningiomas at a single institution. Int J Radiat Oncol Biol Phys. 2009 Jun 1. 74(2):427-32. [Medline]. Wang DJ, Zheng MZ, Gong Y, et al. Papillary meningioma: clinical and histopathological observations. Int J Clin Exp Pathol. 2013. 6(5):878-88. [Medline]. [Full Text]. Dutta D, Lee HN, Munshi A, et al. Intracerebral cystic rhabdoid meningioma. J Clin Neurosci. 2009 Aug. 16(8):1073-4. [Medline]. Zhou K, Wang G, Wang Y, Jin H, Yang S, Liu C. The potential involvement of E-cadherin and beta-catenins in meningioma. PLoS One. 2010. 5(6):e11231. [Medline]. Lakhdar F, Arkha Y, El Ouahabi A, et al. Intracranial meningioma in children: different from adult forms? A series of 21 cases. Neurochirurgie. 2010 Aug. 56(4):309-14. [Medline]. Norden AD, Drappatz J, Wen PY. Advances in meningioma therapy. Curr Neurol Neurosci Rep. 2009 May. 9(3):231-40. [Medline]. Chamberlain MC, Tsao-Wei DD, Groshen S. Temozolomide for treatment-resistant recurrent meningioma. Neurology. 2004 Apr 13. 62(7):1210-2. [Medline]. Milker-Zabel S, Huber P, Schlegel W, Debus J, Zabel-du Bois A. Fractionated stereotactic radiation therapy in the management of primary optic nerve sheath meningiomas. J Neurooncol. 2009 Sep. 94(3):419-24. [Medline]. Haase D, Schmidl S, Ewald C, Kalff R, Huebner C, Firsching R, et al. Fatty acid synthase as a novel target for meningioma therapy. Neuro Oncol. 2010 Aug. 12(8):844-54. [Medline]. Oya S, Kim SH, Sade B, Lee JH. The natural history of intracranial meningiomas. J Neurosurg. 2011 May. 114(5):1250-6. [Medline]. Smith JL, Vuksanovic MM, Yates BM, Bienfang DC. Radiation therapy for primary optic nerve meninigiomas. J Clin Neuroph. 1981. 1:85-99. [Medline]. Mirimanoff RO. New radiotherapy technologies for meningiomas: 3D conformal radiotherapy? Radiosurgery? Stereotactic radiotherapy? Intensity-modulated radiotherapy? Proton beam radiotherapy? Spot scanning proton radiation therapy. . or nothing at all?. Radiother Oncol. 2004 Jun. 71(3):247-9. [Medline]. Nutting C, Brada M, Brazil L, et al. Radiotherapy in the treatment of benign meningioma of the skull base. J Neurosurg. 1999 May. 90(5):823-7. [Medline]. Hasegawa T, Kida Y, Yoshimoto M, Iizuka H, Ishii D, Yoshida K. Gamma Knife surgery for convexity, parasagittal, and falcine meningiomas. J Neurosurg. 2011 May. 114(5):1392-8. [Medline]. Kondziolka D, Levy EI, Niranjan A, et al. Long-term outcomes after meningioma radiosurgery: physician and patient perspectives. J Neurosurg. 1999 Jul. 91(1):44-50. [Medline]. Kondziolka D, Niranjan A, Lunsford LD, Flickinger JC. Stereotactic radiosurgery for meningiomas. Neurosurg Clin N Am. 1999 Apr. 10(2):317-25. [Medline]. Magill ST, Theodosopoulos PV, McDermott MW. Resection of falx and parasagittal meningioma: complication avoidance. J Neurooncol. 2016 Nov. 130 (2):253-262. [Medline]. Williams BJ, Yen CP, Starke RM, et al. Gamma Knife surgery for parasellar meningiomas: long-term results including complications, predictive factors, and progression-free survival. J Neurosurg. 2011 Jun. 114(6):1571-7. [Medline]. Strassner C, Buhl R, Mehdorn HM. Recurrence of intracranial meningiomas: did better methods of diagnosis and surgical treatment change the outcome in the last 30 years?. Neurol Res. 2009 Jun. 31(5):478-82. [Medline]. Agarwal V, Babu R, Grier J, et al. Cerebellopontine angle meningiomas: postoperative outcomes in a modern cohort. Neurosurg Focus. 2013 Dec. 35(6):E10. [Medline]. Al-Mefty O, Smith R. Clival and petroclival meningiomas. Al-Mefty O, ed. Meningiomas. New York, NY: Raven; 1991. Alexiou GA, Vartholomatos G, Tsiouris S, et al. Evaluation of meningioma aggressiveness by (99m)Tc-Tetrofosmin SPECT. Clin Neurol Neurosurg. 2008 Jul. 110(7):645-8. [Medline]. Cappabianca P, Cirillo S, Alfieri A, et al. Pituitary macroadenoma and diaphragma sellae meningioma: differential diagnosis on MRI. Neuroradiology. 1999 Jan. 41(1):22-6. [Medline]. De Monte F, Al-Mefty O. Meningiomas. Kaye AH, Laws ER, eds. Brain Tumors: An Encyclopedic Approach. Ediburgh, Scotland: Churchill Livingstone; 1995: 675-704. Drummond KJ, Zhu JJ, Black PM. Meningiomas: updating basic science, management, and outcome. Neurologist. 2004 May. 10(3):113-30. [Medline]. Feldman RP, Marcovici A, Suarez M, Goodrich JT. Foreign body granuloma mimicking intracranial meningioma: case report and review of the literature. Neurosurgery. 1999 Apr. 44(4):855-8. [Medline]. Haddad GF, Al-Mefty O. Approaches to petroclival tumors. Wilkins RH, Rengachary SS, eds. Neurosurgery. 2nd ed. New York, NY: McGraw-Hill; 1996. Vol 2: 1695-706. Haddad GF, Al-Mefty O. Meningiomas: an overview. Wilkins RH, Rengachary SS, eds. Neurosurgery. 2nd ed. New York, NY: McGraw-Hill; 1996. Vol 1: 833-42. Haddad GF, Al-Mefty O. The road less traveled: transtemporal access to the CPA. Clinical Neurosurgery. 1994. 41:150-167. Iwai Y, Yamanaka K, Yasui T, et al. Gamma knife surgery for skull base meningiomas. The effectiveness of low-dose treatment. Surg Neurol. 1999 Jul. 52(1):40-4; discussion 44-5. [Medline]. Jaffrain-Rea ML, Minniti G, Santoro A, et al. Visual improvement during octreotide therapy in a case of episellar meningioma. Clin Neurol Neurosurg. 1998 Mar. 100(1):40-3. [Medline]. Kleihues P, Cavanee W. World Health Organization Classification of Tumours: Pathology and Genetics: Tumours of the Nervous System. Lyon, France: IARC; 2000. Klutmann S, Bohuslavizki KH, Tietje N, et al. Clinical value of 24-hour delayed imaging in somatostatin receptor scintigraphy for meningioma. J Nucl Med. 1999 Aug. 40(8):1246-51. [Medline]. Kotzen RM, Swanson RM, Milhorat TH, Boockvar JA. Post-traumatic meningioma: case report and historical perspective. J Neurol Neurosurg Psychiatry. 1999 Jun. 66(6):796, 798. [Medline]. Larner AJ, Ball JA, Howard RS. Sarcoid tumour: continuing diagnostic problems in the MRI era. J Neurol Neurosurg Psychiatry. 1999 Apr. 66(4):510-2. [Medline]. Lee GK, Coel M, Ko J, Tom B. Two meningiomas detected incidentally by Tc-99m HDP bone scintigraphy during a work-up for breast cancer. Clin Nucl Med. 1999 Jul. 24(7):525-6. [Medline]. Liu M, Liu Y, Li X, Zhu S, Wu C. Cystic meninigioma. J Clin Neurosci. 2007 Sep. 14(9):856-9. [Medline]. Lusis E, Gutmann DH. Meningioma: an update. Curr Opin Neurol. 2004 Dec. 17(6):687-92. [Medline]. Nakasu S, Nakasu Y, Nakajima M, et al. Preoperative identification of meningiomas that are highly likely to recur. J Neurosurg. 1999 Mar. 90(3):455-62. [Medline]. Norden AD, Drappatz J, Wen PY. Targeted drug therapy for meningiomas. Neurosurg Focus. 2007. 23(4):E12. [Medline]. Perry A, et al. Meningiomas. Louis DN, Ohgaki H, Wiestler OD, Cavenee WK, Burger PC, Jouvet A, et al. World Health Organization Classification of Tumours of the Central Nervous System. 4th ed. Lyon: IARC; 164-172. Rempel SA, Ge S, Gutierrez JA. SPARC: a potential diagnostic marker of invasive meningiomas. Clin Cancer Res. 1999 Feb. 5(2):237-41. [Medline]. Runzi MW, Jaspers C, Windeck R. Successful treatment of meningioma with octreotide [letter]. Lancet. 1989 May 13. 1(8646):1074. [Medline]. Sharif S, Brennan P, Rawluk D. Non-surgical treatment of meningioma: a case report and review. Br J Neurosurg. 1998 Aug. 12(4):369-72. [Medline]. Vaicys C, Schulder M, Wolansky LJ, Fromowitz FB. Falcotentorial plasmacytoma: case report. J Neurosurg. 1999 Jul. 91(1):132-5. [Medline]. Whittle IR, Smith C, Navoo P, Collie D. Meningiomas. Lancet. 2004 May 8. 363(9420):1535-43. [Medline]. Case 1: Bone flap seen along the removed meningioma in toto. Case 2: Gadolinium-enhanced MRI of a meningioma invading the overlying dura and bone. Compare with appearance in Case 1. Case 2: Bone-window CT scan reveals the skull involvement. Note the absence of tumoral calcification. Case 2: Intraoperative view shows the skull involvement. Case 2: Surgical specimen. Complete resection was achieved. Case 3: Tentorial meningioma. A, Contrast-enhanced CT scan shows the enhancing meningioma. Transverse T1-weighted MRIs shows isointensity of the tumor compared with the surrounding brain (B) and its homogenous enhancement (C). Coronal (D), coronal enhanced (E), and sagittal enhanced (F) T1-weighted MRIs. Posterior circulation angiograms show tumoral blush (arrow in G) and the Bernasconi-Cassinari artery (arrow in H). 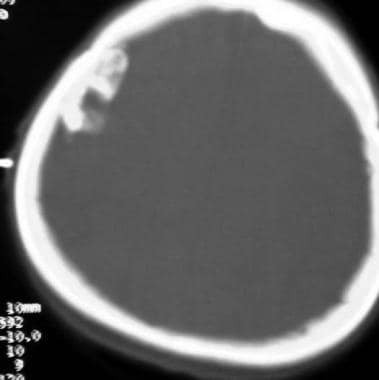 Case 3: Tentorial meningioma. Gadolinium-enhanced T1-weighted MRI immediately (A) and 2 years after surgery (B-D). Transverse images show posterior (arrow in B) and anterior (arrow in C) recurrence involving the tentorium. Sagittal images show posterior (D) and anterior (E) recurrence involving the tentorium. Lower vignette reveals complete excision of the recurrence after a second operation. Case 3: Tentorial meningioma A, Pathology showed syncytial meningioma. Note hypercellularity and minimal whorling (hematoxylin-eosin, original magnification X400). B, MRI performed 4 years after the first operation reveals a recurrence over the posterior tentorium. C, Two-dimensional planning for stereotactic radiosurgery. Three recurrences lie in the plane of the tentorium on a single line. D, Three-dimensional planning for stereotactic radiosurgery. Three arcs were used to irradiate the largest recurrence. Case 4: Recurrent subcutaneous meningioma. A, Patient underwent surgery for a parieto-occipital meningioma in 1978. She was lost to follow-up until 1996, when this transverse T2-weighted MRI was obtained. 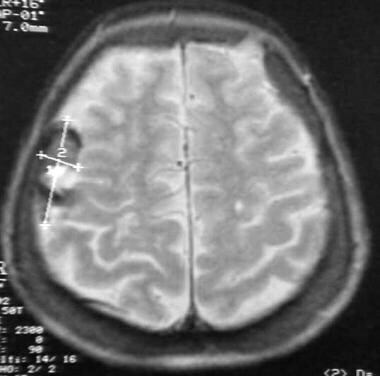 Arrow indicates surgical bed of the resected meningioma. B, Although the initial surgical bed is tumor-free, sagittal T2-weighted MRI shows a large subcutaneous recurrence. C, Lower transverse section also shows recurrence. Note variegated appearance of the tumor. D, Transverse section at a lower level. Postoperative sagittal (E) and transverse (F, G) enhanced T1-weighted MRI shows gross total removal of the tumor. H and I, Tumoral recurrence 3 months after surgery, at the same level as in G and F, respectively. Patient received repeat surgery for subtotal removal of the tumor; a pediculated subcutaneous flap was used to close the surgical defect. After surgery, patient received conventional radiotherapy. Case 5: Bilateral olfactory meningioma invading the facial sinuses. Coronal (A), transverse (B), and sagittal (C) gadolinium-enhanced T1-weighted MRI shows bilateral olfactory meningiomas, and the falx dividing the tumor in 2. Arrow indicates tumor invasion of the sinuses. D, Postoperative enhanced T1-weighted MRI shows that the tumor was completely removed by means of craniotomy and a transfacial approach. E, Tumor was first approached intracranially. Enhanced T1-weighted MRI reveals complete excision of the intracranial component. Arrow indicates residual in the sinuses. F, Residual was completely excised by means a transfacial approach performed with the otolaryngology team. Case 6: Subfrontal meningioma in a patient with abnormal behavior. A, Contrast-enhanced CT scan clearly shows bilateral subfrontal meningioma. B, Transverse T1-weighted MRI of same lesion. C, Intense gadolinium enhancement of the tumor. Coronal (D) and sagittal (E) gadolinium-enhanced T1-weighted MRIs. F, Anterior circulation angiogram reveals posterior displacement of the anterior cerebral artery by tumor. G, Postoperative MRI shows complete removal of the tumor. H-I, Pathology slides (hematoxylin-eosin; original magnification X100 in H, X400 in I) show syncytial meningioma with well-identified whorls and no psammoma bodies. Case 7: Parasagittal meningioma invading the superior sagittal sinus (SSS). A, Sagittal T1-weighted MRI shows a meningioma (arrow). B, T2-weighted MRI. Note midline shift and tumoral invasion of the skull (arrow). C, Transverse T2-weighted MRI. D, Angiogram shows invasion of the SSS, which remains patent. Sagittal (E, G), transverse (F) postoperative T1-weighted MRI. H, Gadolinium-enhanced postoperative T1-weighted MRI shows residual tumor, which was intentionally left to preserve patency of the SSS. I, Pathology slide (hematoxylin-eosin, original magnification X100) shows a highly vascular syncytial meningioma. Pathology slides (hematoxylin-eosin; original magnification X400 in A-B, X100 in C-D). A, Fibroblastic meningioma (arrowheads) abutting the dura (arrow). B, Psammomatous meningioma (arrow indicates psammoma body). C, Meningothelial meningioma, tumor in case 4. E, Meningioma with marked vascularity (arrowheads indicate meningioma cluster; arrow, vessel wall). Case 4: Pathology slides (hematoxylin-eosin, original magnification X400). A, Meningioma with malignant features, as evinced by prominent nucleoli (yellow dot) and mitoses (arrows). B, Intranuclear cytoplasmic intrusion (pseudoinclusion). This is an extra-axial tumor. Glioblastoma multiforme (GBM) and astrocytoma are intraparenchymal tumors, and GBM enhances in a variegated fashion. Acoustic schwannomas are seen in the posterior fossa but not in this location. Fibrous dysplasia involves the skull but does not cause this amount of compression. Surgery on a 46-year-old female with a 2-cm, dural-based enhancing tumor along the left frontal convexity. The lesion was presumed to be a meningioma and showed serial enlargement on MRI, prompting the procedure. Pathology confirmed the tumor to be a WHO grade I meningioma. Video courtesy of Anand I. Rughani, MD, and Jeffrey E. Florman, MD. Meningioma resection in the tuberculum sellae. Video courtesy of Anand I. Rughani, MD, and Jeffrey E. Florman, MD. The authors and editors of Medscape Reference gratefully acknowledge the contributions of previous coauthors Tarafa Baghdadi, MD and Roukoz B Chamoun, MD to the development and writing of this article.